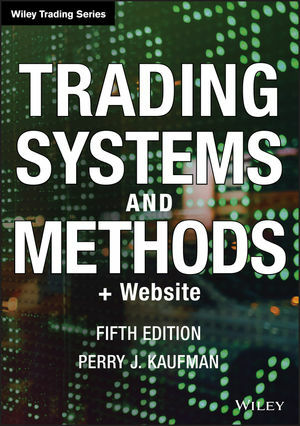 For nearly thirty years, professional and individual traders have turned to Trading Systems and Methods for detailed information on indicators, programs, algorithms, and systems, and now this fully revised Fifth Edition updates coverage for today's markets. The definitive reference on trading systems, the book explains the tools and techniques of successful trading to help traders develop a program that meets their own unique needs. PERRY J. KAUFMAN has over thirty years of experience in the equity and derivatives markets. A prominent expert on systematic trading, he travels internationally, lecturing to funds, governments, and portfolio managers. He began his career in the aerospace industry, working on the navigation and control systems of the Gemini space program. The markets captured his attention in the early 1970s, and he was one of the first to develop computer models for making market decisions. Kaufman developed a portfolio optimization program that operates on disjoint equity series output from a trading environment. He has created market-neutral strategies, stat-arb trading methods, short-term program trading for cash, and derivative market instruments for institutional and commercial applications. Kaufman was the first chairman of the advisory board of the Vermont Securities Institute, and has served on the Director's Committee of Columbia University's Center for the Study of Futures Markets, founding the Journal of Futures Markets. In 2002, he taught a landmark course in systematic trading at the graduate school of Baruch College. Perry Kaufman is the author of several popular trading books including A Short Course in Technical Trading and Alpha Trading. Mr. Kaufman can be contacted through his website perrykaufman.com. Just before last line, the ".060" is a typo. It should have been "0.60". The first line, that changes "R = 0.33, or 33%" to "R = 0.66, or 66%"